This is the perfect option if you're looking to "try out" our Meat CSA before diving into a 6 month subscription! 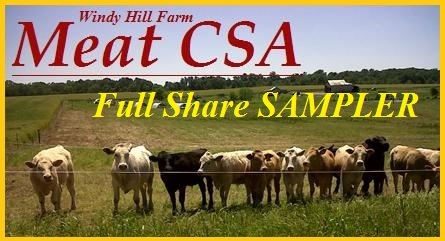 FULL Share Samplers will contain a 20 lb variety of our delicious Grassfed Beef and Pastured Pork! To join our 6 month Meat CSA Program email us at windyhillfarm@ctc.net and request an application.